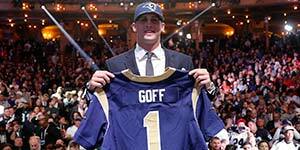 Published: April 29, 2016 at 03:38 a.m.
CHICAGO -- Day 1 of the 2016 NFL Draft is in the books, and now it's time to turn our attention to Day 2. It wasn't physical ability with Jack but his surgically repaired right knee. And I'm not sure he helped himself much by saying on Wednesday that the knee would likely require microfracture surgery. I know of at least two teams prior to that statement that had passed him physically. At some point he becomes a risk worth taking. Teams just weren't willing to take it in the first round. It will probably take a team with multiple second-round picks -- like the Titans, Seahawks or Patriots -- to pull the trigger. I was shocked when Robinson didn't go in the first round. He's a big man who moves very well. I'm not sure why he's still there. It could be the depth of the position he plays, with teams believing they can wait. Whatever the reason, some team is going to get a steal. I have to admit, I probably graded him too high. I put too much stock in his three-sack performance against Alabama in the National Championship game. Still, he's a very good player, and one of the top remaining pass rushers. I think teams have serious concerns about whether Ragland can be a three-down player. I think he can, but obviously falling to the second round says otherwise. I was a little surprised when Green Bay passed on him to take DT Kenny Clark. There was a report Thursday that teams had flagged Ragland for an enlarged aorta, but I don't think that was much of a factor in his fall to Day 2. Reed is a very strong player who plays the run extremely well. He doesn't provide a lot of pass rush, which might have hurt him. He doesn't possess any special traits or have a wow factor, but he's pretty good at a lot of things. I think he'll play a long time in the NFL. I would bet he's one of the first players off the board on Friday. He's one of the few pure pass rushers with speed that remain. He's a very good athlete who's probably best suited as an outside linebacker in a 3-4 defense. Only one running back was taken in the first round -- Ohio State's Ezekiel Elliott, who went to the Cowboys with the No. 4 pick. Elliott is an exceptional athlete with special skills. Henry's not in the same category, but he's a big back who can keep the chains moving. I think he'll be off the board by the middle of the second round. It's no surprise Henry didn't go in the first round. He's a tight end with limitations. Teams are concerned about his blocking. But he's still the best of a weak tight end class and has what I believe is second-round value. Seven offensive linemen went in Round 1, leaving Spriggs as the top option on Day 2. He has pretty good athletic ability for a man his size (6-6 5/8, 301) and started 47 games with the Hoosiers. Other players I don't think will be around very long on Friday: DT Chris Jones, DE Jihad Ward, WR Sterling Shepard, and CB Mackensie Alexander. I think the Chiefs are candidates to take Alexander after trading out of the first round.